Home // Restaurant Reviews // San Francisco Restaurant Reviews // Is it a Bird? Is it a Plane? No, it's a Fish, and at Anchor & Hope, it's Delicious. Is it a pirate ship? Is it an oceanic habitat? Is it a warehouse sprinkled with a few tables, posing as a fine-dining restaurant? Or is it simply a place to kick back after a long day of work for a drink and a solid meal? After visiting Anchor & Hope, an unassuming restaurant tucked away on a side street in SOMA, I’m convinced that it’s all of the above. This is not the sort of restaurant where you sit back in your seat, sip your whiskey rocks, and let the mood lighting ease you into the setting – the second you step foot inside, the spacious, barge-like environment embraces you head on. From the wooden rafters, the lengths of rope hanging from the ceiling, to the lamps painted to resemble giant eyeballs, it’s clear that you’re here for a deep-sea culinary adventure. There’s only one possible way to embark on a seafood journey and that, my friend, is with raw oysters. Succulent Kusshi oysters ($3, with a shallot mignonette and cocktail sauce) were not only a perfect start to our meal, but some of the best raw oysters I’ve ever had. Since Anchor & Hope is known for their “Angels on Horseback” (smoked bacon-wrapped oysters with a remoulade sauce, $13) we clearly couldn’t pass up the opportunity to try this dish of legend. And legendary it was. I am not a follower of the school of thought which dictates that “everything is better with bacon,” however, the bacon in this dish mimicked the texture of the oyster, provided the perfect amount of salt, all while not overpowering the subtle, juicy flavor of the oyster itself. 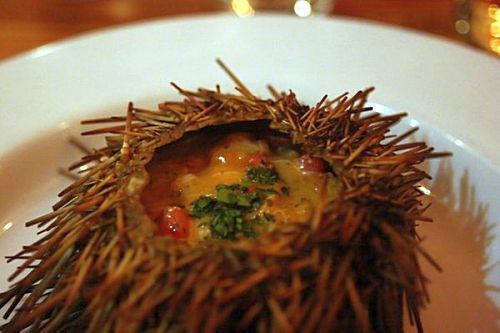 What followed was not only the best dish of the meal, but one of the best dishes of the year – warm Sea Urchin ($16.50) served with Dungeness crab and a lemon beurre blanc. So rich, so creamy, with the aroma of the ocean present in every bite, I’m officially labeling it the “foie gras of the sea.”I was so enthralled by this dish that I caught myself feverishly scraping the sides of the urchin to spoon out every last drop. While the entrees that followed were not as overwhelming as they appetizers, they were well-balanced, well-seasoned, and so large that they could’ve fed a family of 12. Prosciutto-wrapped trout ($26) served over heaps of traditionally paired butternut squash, brussel sprouts, and almonds was an example of how solid execution can make a familiar dish completely satisfying. Mediterranean Mussel Stew ($28), packed with Mahi Mahi, roasted pepper, and chorizo was both well-developed and comforting. Dessert left something to be desired, as the chocolate cake ($8.5) was a bit too dry, and the cut of the salt chunks that were included were too thick. But frankly, the portion size of both the appetizers and entrees makes it difficult for even the most voracious diner to save room. With generous portions, excellent execution, and expressive flavors, the sea truly comes to life on the plate, and if you haven’t had a chance to experience Anchor & Hope, it’s time to explore uncharted waters.